iOS notifications are now interactive, allowing you to take action from the drop-down bar to respond to a message or dismiss a calendar reminder. 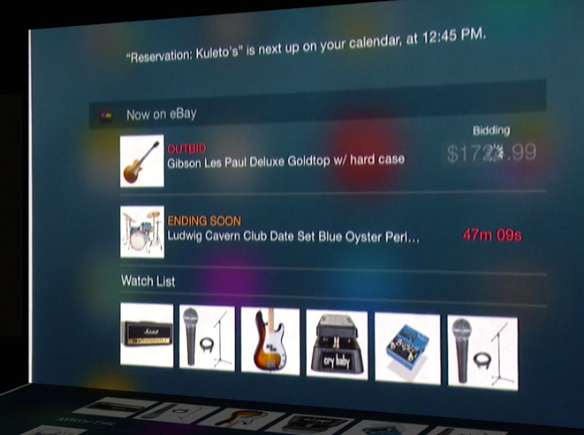 That functionality is open to third-party apps too, as this eBay widget demonstrates. 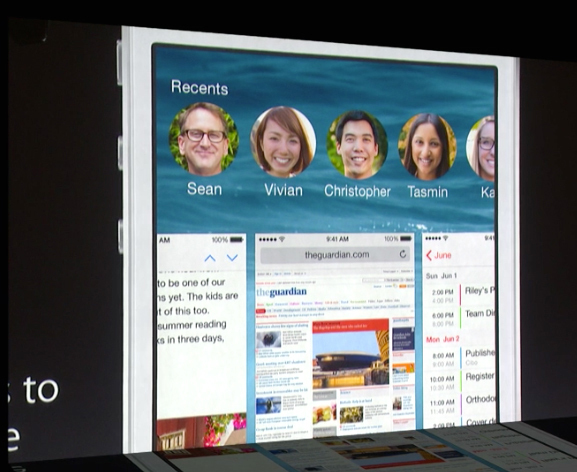 Double-tapping the home button resulted in this tabbed view of all your app screens in iOS 7. Now when you do that, you’ll also see the people you most commonly interact with, one tap away from a phone call or text message to that person. Spotlight search for iOS 8 has been updated to include a wider variety of content. You might see messages you’ve exchanged, in-app content, apps you could download from the App Store, or content available for streaming. There’s also articles from Wikipedia, recent news, and local listings in this view now. 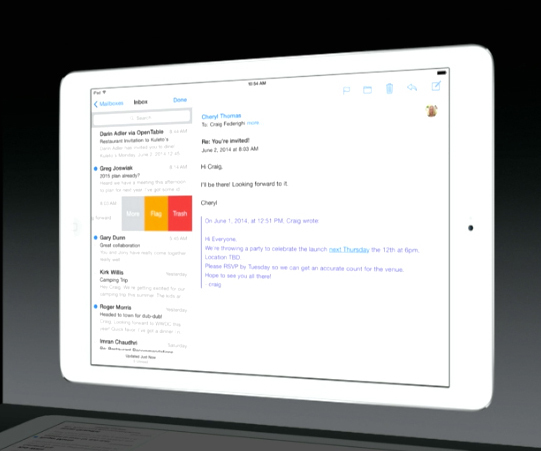 The iOS mail app is getting some updates to do certain things more quickly. For example swipe across a message towards the left to access options to mark as unread or delete it. A new Maildrop feature will turn big files into downloadable links from the iCloud server, so instead of a bounced message, your recipient can just download that file up to 5 GB in size. 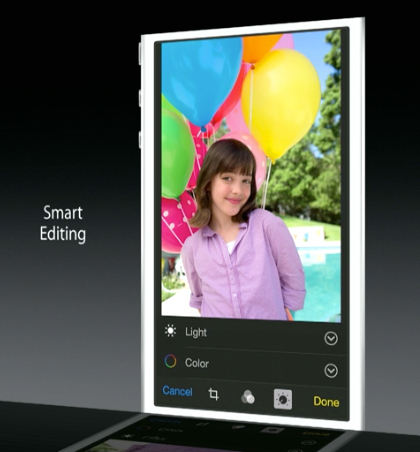 The photos app in iOS 8 will offer more ways to edit your photos, with features to straighten, crop, and colour correct your images. New iCloud integration allows you to access all of your photos across all your devices, regardless of which one you shot the image with. The new QuickType feature in iOS presents a smarter algorithm for predictive typing. It learns not only your typing style, but the different ways you talk to specific people in specific apps. 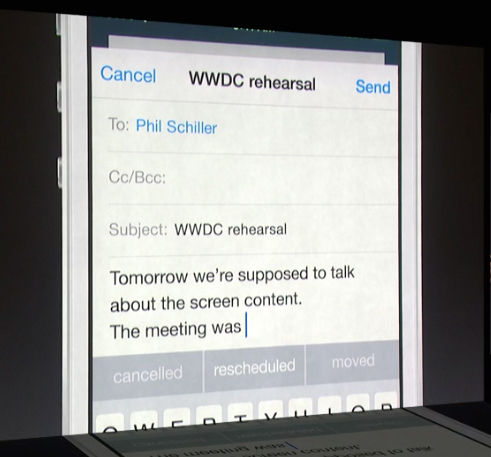 The predictive typing is done on board and is not sent to the cloud. 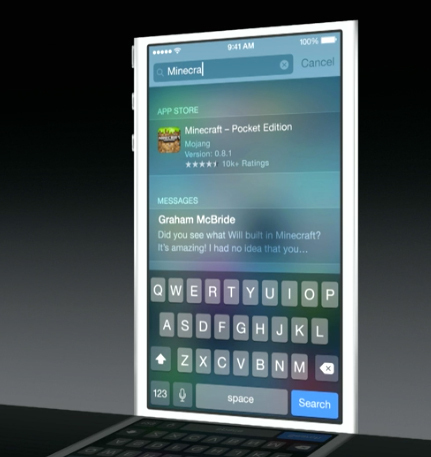 Apple will also now allow third-party keyboards into the App Store. 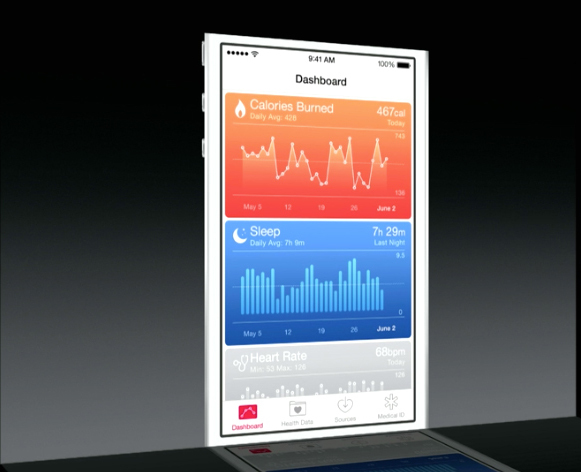 The new Health app will compile all your health-related information into one place, including data from third-party apps, such as your Nike+ app that tracks your jogging. Health providers may soon use this data to help manage patients, and in fact the Mayo Clinic plans to do just that with some of its patients. Users will have more control over message threads, including the ability to name a thread and to turn on a “do not disturb” mode for a message thread that’s getting too annoying. All photos in a message through will now be grouped together in the same place within the thread. 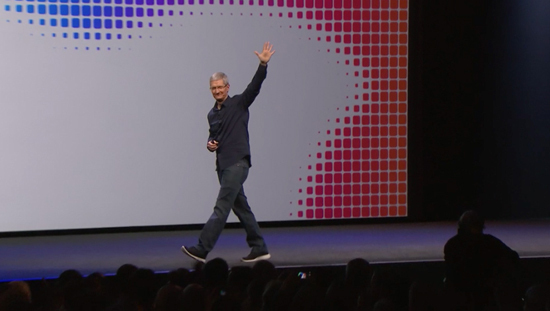 Siri is getting an update along with iOS 8. 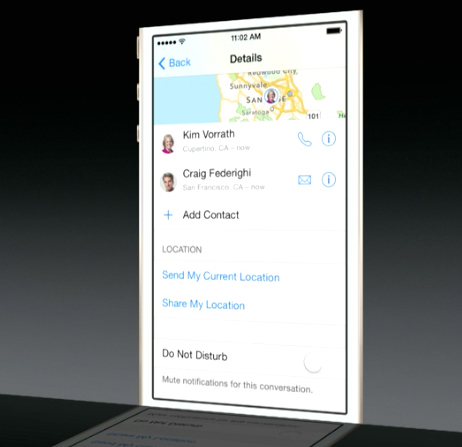 Now iPhone users can activate Siri just by saying “Hey, Siri” while driving, with no need to push a button. 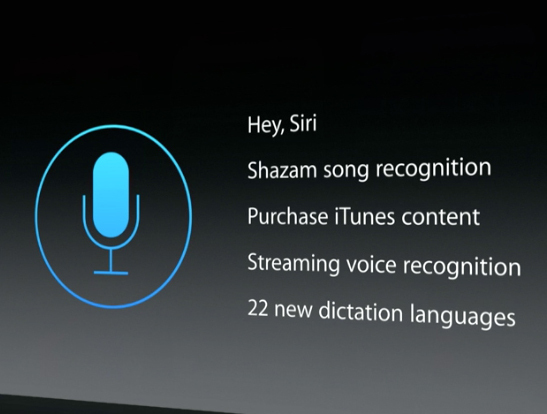 There’s also integrated song recognition as a result of Apple’s Shazam acquisition and support for 22 new languages. Users will have better ways to judge whether they should download an app or not. 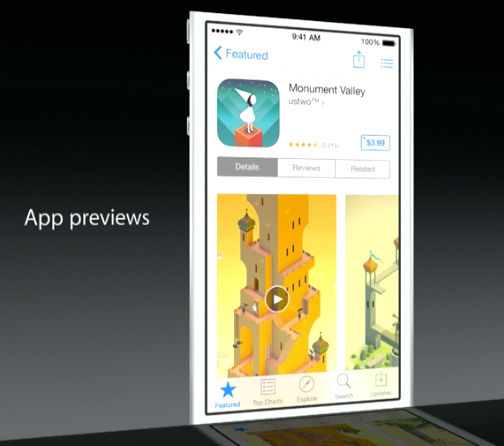 A preview video can now be inserted alongside screenshots in the App Store. Developers can also conduct beta testing through the App Store using TestFlight, a new service that will allow users to opt-in to a beta period and then give feedback on an app.